This is a small project I completed by myself in less than 2 hours. Since all the code is written, you should be able to get to the same result within less than an hour. Ready, go! Before we start: earlier this month, we announced the release of the Overlay.live nodeJS library. This library allows anyone to build telemetry solutions for Overlay.live – with just a minimum amount of configuration. Of course, I’m not going to lie to you. A minimal amount of coding, linux and electronic knowledge is helpful to complete this project. But if you’ve done small Arduino or RaspberryPi based projects using NodeJS or Python – then you should be fine. 1x DHT 22 sensor also know as AM2302 – I’m using this one because … that’s what I found at the local electronic store. And of course, don’t forget the other indispensables: a monitor plus HDMI cable, keyboard and mouse, RPi power adapter and USB cable. SD card with Operating System – simply download the latest Raspbian distro (recommended with desktop). Use Etcher to burn the .img on your SD Card. Insert in the Pi and boot it up. NC -> White Cable -> Not connected, I removed it. Now it’s time for a little bit of terminal. 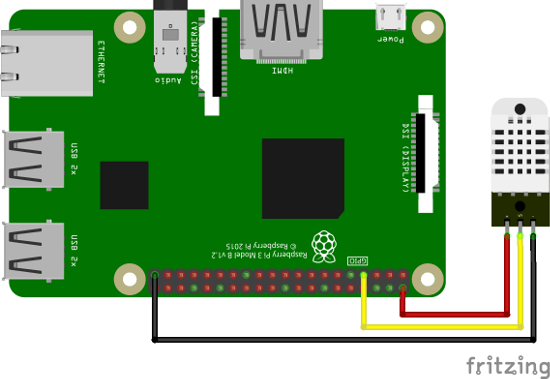 Before doing so, make sure your RPi is connected to the Internet! Navigate with the Terminal to the Download Folder, unzip, enter the folder, compile, install. Before going any further, I recommend that you test your sensor quickly. This is to make sure everything works before getting Overlay.live involved. devicekey => replace YOUR_CUSTOM_DEVICE_NAME by your manual device key. Note: To create a new device key, head over to your Overlay.live Dashboard. Click “Add Manual Device” copy the proposed key, label the device and save. Then save the edited config file. You are now ready to stream telemetry to your Overlay.live account. To start the stream we will run the humtemp.js nodeJS script. This is a script that runs in the terminal and could be configured to run on you RPi startup (daemon). If it’s all working well, you should see the values being displayed and updated in realtime. Congrats! Final step, the overlay. The whole point is to overlay the Telemetric data over a video stream. In your Dashboard, under Overlay, click the “Add Overlay” button. Name it to your liking and save. On the right, select from the “Add Sensor” drop-down the two sensors we’ve just added. Temperature and Humidity. These can be placed anywhere you like on the green screen. If you double click the sensor box, you can customize the looks of it. Press “Save” to record the changes to the block. Scroll down, copy the Overlay Link and save your overlay. For this example we will use the Open Broadcaster Software – OBS. In the Sources add a new source type “webpage”. In the configuration panel that opens, paste the Overlay link, change the display setting to 1920 x 1080 (Full HD is the recommended webpage load resolution). And Save. Automatically, this will load the Overlay and display the values in real time. It all works, you can now configure your cameras and go live! That’s it for this guide. Let me us know in the comments if you have any questions.